Hello friends! Happy almost New Year! So here we are... Saying goodbye to 2017 and looking forward to what 2018 has in store for us. 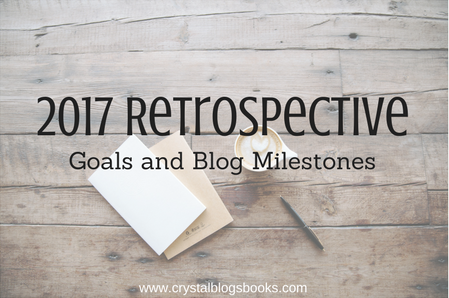 And since I'm experiencing a little bit of a reviewing block (I refuse to call it a slump), I thought this would be the perfect time for me to take a look back at the milestones I reached with the blog and how I did on my goals. If you'd like to see my 2017 Reading and Blogging goals, you can visit the blog post here. Wow! 2017 was an amazing year on my blog. So many big milestones happened and I couldn't be happier. Each milestone definitely reinvigorated and renewed my love of blogging. And yes, I did get a little obsessed with some of them. In my defense, they were all exciting for me. Crystal Blogs Books turned 5... Whaaa? When I first started my blog, I had no idea I'd make it to 5 years. Wow! Avon Addict... I haven't mentioned this here (and it's more of a personal milestone), but I was picked for my 2nd term as an Avon Addict. I can't believe the things I accomplished this year. I can't wait to celebrate the blog's 6th birthday. What else will happen in 2018? Update Goodreads More - Well, I tried. Really, I did. I failed miserably, but I tried. Finish Some Series - I am pretty sure I didn't even touch this one with a 10 ft. pole. It is definitely one of my reading challenges for 2018. Hopefully I'll do better next year. Read More Print Books - I think I did pretty well here. I definitely read more print books this year. However, my shelves are still overflowing. I'm going to re-do this one again for next year with a different goal. Read Books BEFORE Meeting Authors - Oh crap, this one was all over the place. I did better than last year, but failed miserably with a couple events. I at least tried with each author signings. That's worth something... Right? Get to Know Blogger Better - YES! I actually learned a lot about Blogger this year and I'm super excited about it. There are still so much more to learn, but I am very happy with where I'm at. I even did an extensive re-design. Do you like it? Blog Ahead More - Can we not go there? I had every intention of blogging ahead this year and failed each time. I'm thinking about trying it again next year, but I just may not be the blog ahead type of blogger. Review Quickly - Again, nope! This is one I really need to work one and it'll definitely be a goal for next year. Reach 500 Reviews - YES!! As of right now I am at 542 with 2 more scheduled for this week. Wahoo! So, there you go. I accomplished some of my goals and failed miserably with others. And you know what? I'm okay with that. By the end of the year, my blog has come so far and I know it'll only get better in 2018. It's the growth that is most important. Eeeep! Super excited for you! Glad you reached 100,000 views! OMG! OMG!!! Good luck with 2018! We all need it!